Anti-Brexit parties have come together to insist the DUP does not represent the majority view in Northern Ireland. 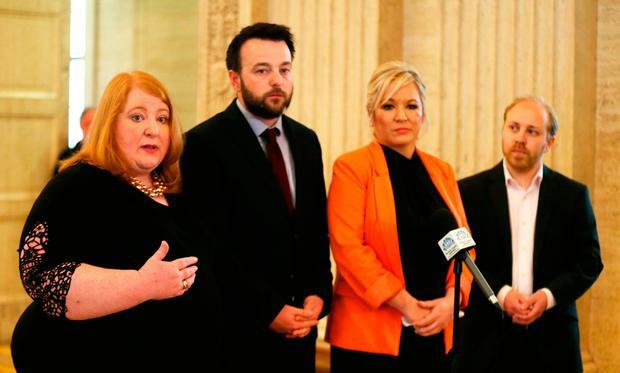 In a rare move, leaders of Sinn Féin, the SDLP, the Alliance Party and Green Party presented a united front at Stormont in calling for the UK to remain in the EU's single market and customs union structures post-Brexit. They believe that is the only way to avoid the re-emergence of a hard Border on the island of Ireland post-Brexit. The parties represent 49 out of the Assembly's 90 seats, in a region where 56pc voted Remain in the EU referendum. The party leaders claimed the UK government was not paying heed to the majority view, and instead indulging its Brexiteer confidence and supply partners at Westminster, the DUP. Sinn Féin vice-president and Stormont leader Michelle O'Neill said the EU negotiators needed to hear "loud and clear" that people in the North wanted to remain within European structures. SDLP leader Colum Eastwood claimed elements of the DUP were also "warming" to the idea of continued alignment with the EU in terms of customs and single market rules. Alliance leader Naomi Long said the UK government was not hearing the majority opinion: "They are only hearing the most extreme voices in terms of Brexit. That is not a healthy democratic situation."